*In the case of a ball that does not open with a Grand March, Harvey 1889 details some of the alternatives: "Some balls are opened by a Waltz; this is done when there are not enough in attendance to perform the figures and evolutions of the Grand March. Other balls open with a Lancers, followed by four or five other dances, and then the Grand March; that is usually done when there is some presentation to be made to some popular person or persons present." Clendenen 1895 suggests that "should the company be late on arriving [the March] may be deferred until later when more are present to take part." This last suggestion is especially relevant in modern times. At the start of the Grand March, floor managers help form the couples into a line facing around the room, Follows on the right, Leads on the left. * Dewey 1918 explains that "the man should present his right arm to the lady, she rests her finger tips in the crook of his arm. The couples should march in step and in time to the music; they should step on the left on the accented beat of the music. The man should gauge the length of his step by that of his partner." * The descriptions of some figures (the end of The March in File) imply that the couples are marching counterclockwise around the room, along line of dance as in the round dances. The descriptions of other figures (the beginning of The March in Column), on the other hand, imply that the couples are marching clockwise around the room. So in terms of direction, pretty much anything goes. Who leads the Grand March, and how do the couples line up? Many options are proposed in the sources: the Host of the ball, the master of ceremonies or floor manager, the president or chairman of the organization, an honored guest (i.e., a distinguished scholar, a man of military rank, or even a Senator), or perhaps most reasonably, "a lady and gentleman who understand the details of each figure or change." Some sources suggest that in lining up behind the leader, the couples should fall in according to their rank, e.g., the chairman of the committee, followed by his officers, followed by the guests; the host, followed by his family, followed by his friends; etc. Reilley 1870 proposes that a separate Master of Ceremonies should conduct the Grand March (from the outside, while not marching himself), which is a good idea if the honored leaders of the Grand March may not be the most knowledgeable dancers in the room. Clendenen 1895 suggests that "a second gentleman fully acquainted with the changes should be placed at one end of the room, where each figure is commenced, to act as prompter, his duty being to see that each couple preserve uniformity of action throughout the march." Harvey 1889 gives general tips for making the Grand March a success: "In order to ensure success in a march of this description, no gentleman can be allowed to act as cavalier to two ladies, as the movements require all to march in couples. The leader should regulate his pace to suit circumstances, endeavoring always to keep the line of march unbroken and the couples at uniform distances from each other. The couples, also, must follow exactly in the track of those before them and of the leader, keeping correct time with the music, and conforming in every particular with the leader's movements. The leader should be careful to introduce sufficient plain marching between each figure to get all the couples following him in column before commencing a new evolution." After commencing with a general promenade around the room, the leader is free to lead into one of many figures. Several sources, however, warn that the leader should be careful not to extend the Grand March for too long, lest it get too tedious. Clendenen 1895 writes: "Care should be taken not to give too many figures, making the march wearying and tedious. The three or four figures given here will be found very effective and quite sufficient for length." Harvey 1889 suggests that five figures are "quite sufficient to entertain, without rendering the march tedious and wearing to those participating in it before the dancing commences." For music, most sources (unsurprisingly) suggest a march tune, played moderately, of which there are many from the 19th century to choose from. Every well arranged Ball should commence with this graceful dance in a conversational character, and it is customary that the commencement of this dance should be given to an honorary guest. As soon as the Guest of Honor takes his position on the floor, one of the Managers will notify the company of the commencement of the dance, by a few chords of music. All couples, with the guest of honor at their head, and the leader of the dance as second couple, stand one couple behind the other on one side of the room. The music begins on the signal from the leader of the dance. The first gentleman and lady will promenade around the room, the others will all follow: then the whole will form a single column of two lines, gentlemen on the left and ladies on the right, when they all execute the Grand March around the room, as directed by the Master of Ceremonies. For the March play something easy to keep step with. ("Pride of the Ball Room March" is just the thing.) Let the Dancers march in Couples around the hall about 5 minutes. Balls always are begun with a Grand March. It is the duty of the floor managers to arrange the company in proper lines for the march. Balls are always opened by a "Grand March." The leader is usually the floor-manager, and he is expected to be familiar with the different changes, so as to make the march a pleasing opening to the evening's amusements. All changes should he made at the corners of the room, the marching being done in lines parallel with the walls. We give a few of the changes. The Grand March is a brilliant feature of every ball. It is generally the signal for the opening of festivities. It is led either by the floor manager or the president, accompanied by their ladies; they are followed by the other officers according to their rank; then by the other members and their ladies; and last, but not least, by their friends and guests of the evening. The above is generally the rule, but there are some exceptions; for instance, if the ball is attended by some popular prominent personage, such as a Member of Congress, Senator, or distinguished scholar, &c., as a matter of courtesy they are invited to open the ball by leading the Grand March. All military balls are mostly opened as above exception states. Some balls are opened by a Waltz; this is done when there are not enough in attendance to perform the figures and evolutions of the Grand March. Other balls open with a Lancers, followed by four or five other dances, and then the Grand March; that is usually done when there is some presentation to be made to some popular person or persons present. In the Grand March each gentleman, accompanied by a lady, whom he meets at the door of the ladies' parlor, takes his position in the march, keeping correct time to the music, which is either 2-4, 4-4, or 6-8 time, and should not be either too fast or too slow. In order to ensure success in a march of this description, no gentleman can be allowed to act as cavalier to two ladies, as the movements require all to march in couples. The leader should regulate his pace to suit circumstances, endeavoring always to keep the line of march unbroken and the couples at uniform distances from each other. The couples, also, must follow exactly in the track of those before them and of the leader, keeping correct time with the music, and conforming in every particular with the leader's movements. The leader should be careful to introduce sufficient plain marching between each figure to get all the couples following him in column before commencing a new evolution. Balls are generally opened with a Grand March, which is led by the floor director and aids, followed by the rest of the company. ...when he is ready to stop he will also inform you, and if there is a Cicilian Circle, rap on your stand to attract attention, and say, Please form for the circle, every other couple face about. On an engagement the Grand March will probably be the first number on the programme. The floor manager will generally give you the signal when to start and finish. The march should be played moderately slow. It has been customary for some time past to commence the dance of the evening with a grand promenade or march. Should the company be late on arriving this may be deferred until later when more are present to take part. The march should be led by a lady and gentleman who understand the details of each figure or change. A second gentleman fully acquainted with the changes should be placed at one end of the room, where each figure is commenced, to act as prompter, his duty being to see that each couple preserve uniformity of action throughout the march. Care should be taken not to give too many figures, making the march wearying and tedious. The three or four figures given here will be found very effective and quite sufficient for length. It often happens that the prompter is asked how the figures of the Opening (Grand) March are to be performed; we therefore give the following illustrations. Note: By head of the room is meant the end nearest the music; by foot of the room the end opposite the music; left of room, the left side when facing the music; right of room, the right side when facing the music. Upon entering the dance hall, the lady should precede the man and the chaperone should precede the younger lady. As soon as the music begins, the men should immediately find partners for the march or dance, whichever it may be. A formal party is opened with a Grand March. The host and hostess and members of the family lead the march. At a subscription ball, the chairman of the committee and his lady are the leaders. The members of the committee follow next, and then the other guests. In the march the man should present his right arm to the lady, she rests her finger tips in the crook of his arm. The couples should march in step and in time to the music; they should step on the left on the accented beat of the music. The man should gauge the length of his step by that of his partner. After promenading around the room, march as couples up the center of room from bottom to top. Reaching the top, the Leads split off in single file to the left while the Follows split off in single file to the right, marching solo around the room, counterclockwise and clockwise respectively. When the Leads and Follows meet at the bottom, the Leads pass by on the outside lane, as the Follows pass by on the inside lane, left shoulder to left shoulder, continuing around the room in single file until the lead couple meets up again at the top. Rejoin partners at the top, and continue marching in couples. The leader heads the line of march up the center of the room. Reaching the head he turns to the left and his partner to the right; the gentlemen follow him and the ladies his partner. When the leaders reach the bottom they pass each other, the line of gentlemen going around the room on the outside, the ladies on the inside, and in the opposite direction. When the leader meets his partner at the top of the room, they march together around the room, followed by the others. The leader heads the line of march up the middle of the ball room, in reaching the top he turns to the left and his partner to the right; the gentlemen all follow him and the ladies his partner. When the leaders reach the bottom they pass to the left of each other, the gentlemen marching around the room on the outside, the ladies on the inside and in the opposite direction, when the first gentleman meets his partner at the top of the room, they march together again around the room followed by the other couples. As soon as all are in order the leader should head the line of march up the middle of the room; when he has reached the top he turns to the left, and his partner to the right; the gentlemen all follow him in single file, the ladies following the leading lady in the same manner; when the leaders of the two lines arrive at the bottom they pass to the left of each other, the gentlemen marching round the room on the outside, and the ladies inside them and in the opposite direction. When the first gentleman meets his partner again at the top of the room, they both march together again round the room to the right, followed by the other couples in their order. After promenading around the room until all have formed into a circle around the room, the leaders turn and march up the center of the room, and on reaching the top, the gentlemen should turn to the left and the ladies to the right, each gentleman following in single file, and each lady her leader in like manner. On arriving at the bottom of the room the ladies should pass to the left of each other, the gentlemen marching around the room on the outside of the ladies and the ladies inside. When the gentleman meet their partners at the top of the room they form in couples again and march around the room to the right. Make a complete circuit around the room, continue till foot of the room is reached, march up middle to head of the room, gentlemen to the left, ladies to the right, in single file. At foot of the room files pass to left of each other, continue circuit to head, when partners join and march in couples to right. Promenade clockwise around the room to the bottom left corner, then make a sharp U-turn to the right, doubling back across the room from left to right, forming a second row from the bottom. When necessary (i.e., before hitting the wall, or the line of couples making their way along right wall) make a sharp U-turn to the left, doubling back across the room from right to left, forming a third row from the bottom. Same basic concept, except that it starts at the top left, forming vertical columns that build up from left to right, instead of horizontal rows that build up from top to bottom. The leaders march around the room until they reach the bottom left-hand corner. There, instead of turning at right angles up the side of the room, they must file to the right and march in a line parallel with the advancing couples, but in an opposite direction across the room as each couple arrives at the same corner, they file to the right and follow their leader. When the leader has got across the room the first couple files to the left, and march across back again, and so on forming a serpentine line of march backwards and forwards across the room until the top of the room is reached. To make this effective, it requires a number of couples, so that there will be at least four lines, constantly passing each other in opposite directions. When the first couple reach the top of the room, they lead the march around the room again, until all the couples are following them in regular column. The first couple march around the hall until the leader reaches the bottom left hand corner, then instead of turning at right angles up the side of the room, the first couple must file to the right and march in a line parallel with the advancing couples, but in an opposite direction across the ball room; as each couple arrives at the same corner, they file to the right and follow their leader. When the leader has got across the ball room the first couple files to the left and marches straight across and back again, and so on; forming a serpentine line of march backward and forward across the ball room until the top of the room is reached. In order to make this effective, it requires a large number of couples so that there will be at least four lines constantly passing each other in opposite directions. When the first couple reach the top of the ball room they lead the march around the room again until all the couples are following them in regular column. The first couple lead round the room, the way of the clock, until the leader reaches the bottom left-hand corner. There, instead of turning upwards at right angles up the side of the room, the first couple should file to the right and march in a line parallel with the advancing couples, but in an opposite direction across the room; as each couple successively arrives at the same corner, they file to the right and follow their leader. When the leader has got across the room, the first Couple should file to the left and march straight across back again, and so on, forming a serpentine line of march backwards and forwards across the room until the top of the room is reached. To make this effective, it requires a considerable number of couples, so that there will be at least four lines constantly passing each other in opposite directions, and forming a very pleasing appearance. When the first couple reach the top of the room they lead the march round the room again, until all the couples are following them in regular column. March by couples to corner at left-hand side of head. Turn to right (half around); march down room to foot, a few feet from column at left side of room and in opposite direction, at foot turn to left (half around) and march to head, then turn to right (half around) march to foot, etc., till leaders are marching along right side of room; continue around room till line of couples is formed. After promenading around the room, march as couples up the center of room from bottom to top. When the leaders reach the top, the first couple peels off to the right, and the second couple peels off to the left. Odd couples follow the first couple, even couples follow the second couple. When the first and second couples meet at the bottom, then turn together to face the top, and march from bottom to top "four abreast." When the reach the top, the first quartet wheels around to the right, and follows the path of the first couple, while the second quartet wheels around to the left, and follows the path of the second couple. Likewise for odd and even quartets. Repeat, marching from bottom to top "eight abreast." Repeat, marching from bottom to top "sixteen abreast." *This is how it's described in three concordant sources, but this suggests that the 7th couple (the right-most couple of the first platoon) will lead out of this figure, rather than the leaders, which seems odd. There are many ways one might imagine to fix this, but none is suggested in these three sources. Starts the same way, but halts after eight abreast reach the top. The first platoon files out to the right to form one quadrille, the second platoon files out to form a second quadrille, the third to the right to form a third, etc. Join hands eight to form the sets. If the second dance is a quadrille, this is a perfect variation to transition from the Grand March to the quadrille, and it avoids the mix-up of leadership mentioned above. The leaders march up the center of the room. As they reach the top, the first couple passes around to the right, the second couple to the left; the remaining odd couples in their order to the right, and the even couples following to the left. All thus march down the room, until they meet in the middle at the bottom. There they turn up the center again four abreast. Arriving at the top, the first four wheel around by the right; the second four wheel around by the left, and so on alternately. each division marching down its side of the room. When they meet at the bottom, they advance up the center again, eight abreast. At the top of the room the first and third eight wheel to the right, and the second and fourth wheel to the left, each succeeding eight wheeling right and left alternately, down the sides of the room, meeting at bottom, and marching up the center sixteen abreast, thus forming full lines. At thee top of the room all halt, odd lines facing all to the right; the even lines all to the left, the gentlemen step up by the side of their partners and the front line marches in couples to the right the others following, and finish as "In column." The leader march up the center of the hall. As they reach the top the first couple passes around to the right, the second couple to the left, the remaining odd couples in their order to the right, and the even couples following to the left, all thus march down the hall until they meet in the middle at the bottom. There they turn up the center again four abreast; arriving at the top the first four wheel around by the right, the second four wheel around by the left, and so on in succession, each division marching down its side of the room. When they meet at the bottom they march up the center again, eight abreast At the top of the room the first and third eight wheel to the right, and the second and fourth wheel to the left, each following eight wheeling right and left alternately down the sides of the hall, meeting at the bottom, and marching up the center sixteen abreast, thus forming full lines. At the top of the room all halt, odd lines facing to the right, the even lines to the left, the gentlemen step up by the side of their partners, and the front line marches in couples to the right, the others following and finish as "in column." The first couple lead the march up the centre of the room. As they reach the top, the first couple passes round to the right; the second couple to the left; the remaining odd couples in their order to the right, and the even couples following to the left. All thus march down their side of the room, until they meet in the middle at the bottom. There they turn up the centre again four abreast. Arriving at the top, the first four wheel round by the right; the second four wheel round by the left, and so on alternately, each division marching down its side of the room. When they meet at the bottom they advance up the centre again, eight abreast. At the top of the room the first and third eight wheel to the right, and the second and fourth wheel to the left, each succeeding eight wheeling right and left alternately, down the sides of the room, meeting at bottom, and marching up the centre sixteen abreast, thus forming full lines. At the top of the room all halt, the first, third, &c. (odd) lines face all to the right; the second, fourth, &c. (even) lines all to the left, the gentlemen step up by the side of their lady partners, and the front line marches off in couples to the right, the other lines following in their track, in the same manner as in the March by Columns, and finishing in the same way laid down in that march. March by couples up middle of room; at head first couple to right, second to left, third to right, fourth to left, etc. ; at foot two lines of couples meet, first couple of each line join, march to head four abreast, second couples ditto, etc. ; at head first four to right, second four to left, third four to right, fourth four to left, etc. ; at foot two lines of four meet, first four of each line join, march to head eight abreast, second ditto, etc. ; at head first eight halt, second ditto, etc. When all have halted, first eight to right and form sets for quadrille, second eight to left, and ditto, third eight to right, fourth eight to left, etc. In forming sets for a quadrille, to avoid confusion, four couple join hands, form a circle where the set is to be, release hands and the set is formed. All march around the room in couples. The first couple joins right hands, stops, and raises right hands to form an arch. The second couple passes under the arch (Lead first), and joins hands to form a second arch. Repeat until one continuous arch (or arbor) is formed. The first couple, now in the rear, passes through the whole arbor, followed by each couple in succession, until all the arches have disappeared. If desired, the figure can be extended by the first couple forming another arch immediately after they have passed through the whole arbor, as many times as they want, before continuing on as usual. This starts the same way, except that when the whole arbor has been formed, all stop and step back to separate about six feet from their partners. The leader signals for a waltz to be played, and the first couple waltzes through the alleyway of couples, followed by the second couple, etc. Continue to waltz ad libitum. If the second dance is to be a waltz, this is a nice transition between the Grand March and the waltz. Personally, I'd recommend the slight modification that once the arbor is formed, everyone goes under the arbor once, and after going through the entire arbor, the couples separate by six feet, at the direction of the leader. This way, everyone gets to march through the entire arbor, not just the early couples. This is a well-known and pleasing figure. All march around the room in regular line. The first couple join right hands, stop and raise their hands, forming an arch. The second couple pass underneath the arch, the gentleman first, and form another arch; the third couple pass under both, and also form an arch, and so on, each couple passing through the arches ahead of them in turn, until one continuous arch has been formed. The first couple (now in the rear) their pass through and out at the front end of the arbor, followed by each rear couple in succession, until the arches have all disappeared. If the number of couples is large, the first couple can follow the last couple at once under the arches, and repeat the arbor as long as may be desired. All march around the hall in regular line, the first couple join right hands, stop! and raise their hands, forming an arch, the second couple pass underneath the arch; the gentleman first and form another arch and so on, each couple passing through the arches ahead of them in turns until one continuous arch has been formed. The first couple now in the rear then pass through and out at the front end of the Arbor followed by each rear couple in rotation until the arches have all disappeared. If the number of couples are large the first couple can follow the last couple at once under the arches. All the couples march round the room in order. The first couple join right hands, stop, and raise their hands, forming an arch. The second couple pass underneath the arch, the gentleman first, and form another arch; the third couple pass under both and also form an arch, and so on, each couple passing through the arches ahead of them in turn, until one continuous arch has been formed. The first couple (now in the rear) then passes through and out at the front end of the arbor, followed by each rear couple in succession, until the arches have all disappeared. If the number of couples is large, the first couple can follow the last couple at once under the arches, if preferred, and repeat the arbor continuously as long as may be desired. The plain march in couples is then resumed, until the line of march is in regular order again. All march around to the bottom, stop, join hands and raise them, forming an arch. The second couple pass under the arch, stop and join hands. Third couple pass under both, and so on, each couple passing through and forming the arch until one continuous arch has been formed. All stop, separate about six feet apart, the leader signals the music to change into a waltz, and leads off the waltz down between the lines followed by each one in turn and around the room. March by couples to foot . Partners of first couple face each other, join hands, raise them, thus forming an arch, second couple passes under, stops next to first and forms arch, third couple passes under arches of first and second, stops next to second, forms arch, etc., till last couple has passed under all the arches, itself forming an arch. Then there is aline of arches. Hands are released, lines separate, so as to leave a space of about six feet. Leader gives signal to music and waltzes with his partner between the lines, second couple ditto, third, fourth, etc., till all are waltzing. All march around the room in couples. As the leader turns to march up the center of the room*, he steps in front of his partner, to form one single file line. As the reach the turning point into the center of the room, each Lead does the same. When the leader reaches the top of the hall, he leads the single file line around the room to the right. When he reaches the tail of the line, he passes to the inside of it, spiraling into the center of the room. The spiral continues until the circles are very small, at which point the leader makes a sharp U-turn to the left, and leads the single file line out through the spiral alleyway formed by the single file line spiraling in. Once the spiral is unwound, the Leads step back into place at the left of their partners, and the march continues as usual. *This is how the three sources describe it, but when lots of couples are involved, I recommend starting this variation in the bottom left corner of the room. Otherwise, if the single file line isn't done forming when the leader reaches the starting point again, he may get stuck in half of the room. This is the same figure, just with a new way into and out of it. Start with half of The March in File: Couples march up the center, then Leads peel off to the left, Follows to the right. When the first Follow meets the first Lead at the bottom, she falls in behind him, thus falling into a single file line like a zipper. End with the single file line marching up the center to the top. Leads unzip to the left, Follows to the right. When the first Follow meets the first Lead at the bottom, she falls in next to him, as in the usual march, which continues up the center and around the room in couples. After completing the two figures (simultaneously), the first couple meets up again at the bottom, and rejoins to march in couples up to the top. If desired, the Leads can then complete the Serpentine figure on the left side of the hall as the Follows complete the March in Columns on the right side of the hall. All march once around the room. The leader steps in front of his partner and leads the way up the center; as each couple turns to go up the center, each gentleman steps into single line ahead of his partner, forming by degrees the whole into single file. When the first gentleman reaches the top of the room, he leads the Way to the right entirely around and around the room, each round passing inside the former, describing a serpentine track toward the center. As soon as the inner coil becomes small, the leader turns sharp to the left and retraces his steps between the coils, until he marches between the coils entirely out of them. He continues until all the coils are unwound, and then each gentleman retires a step to the left of his partner, and the march is continued in column until all the couples have fallen into regular order again. All march once around the hall. The leader steps in front of his partner, and leads the way up the center, as each couple turns to go up the center, each gentleman steps into single line ahead of his partner, forming by degrees the whole into single file. When the first gentleman reaches the top of the room, he leads the way to the right entirely around the Hall, each round passing inside the former, describing a serpentine track toward the center. As soon as the inner coil becomes small the leader turns quickly to the left and retraces his steps between the coils, until he marches between the coils entirely out of them. He continues until all the coils are unwound, and then each gentleman retires a step to the left of his partner, and the march is continued in column until all the couples have fallen into regular order again. The couples march once round the room, the way of the clock. The leader steps in front of his lady and leads the way up the centre of the room; as each couple turns to go up the centre, each gentleman steps into single line ahead of his lady, forming by degrees the whole couples into single file. When the first gentleman reaches the top of the room, he leads the way to the right entirely round and round the room, each successive round passing inside the former, describing a spiral track towards the centre of the room. As soon as the inner coil becomes small, the leader turns sharp round to the left and retraces his steps between the coils, until he marches between the coils entirely out of them. He continues his march until all the coils are unwound, and then each gentleman retires a step to the left of his lady partner, and the march is continued in column until all the couples have fallen into regular order again. First couple lead up the center to the top, ladies turn to the right, gentlemen to the left. The ladies lead round and round the room, each time passing inside the former, until the coil is very small, then the leader turns short around to the left and retraces her steps between the coils until all the coils are unwound. While the ladies are forming the coil the gentlemen march across the top of the hall, on reaching the side turn and advance two steps, turn one-quarter and march back to center, turn one-quarter and advance two steps, turn and march to side. Continue marching across and back until you reach the bottom of the hall. The lady and gentleman should guide their work so they meet at the bottom and march up through the center together. This figure may be repeated by the gentlemen making the coil and the ladies march across and back. March in couples; at head of the room ladies to the right, gentlemen to the left; at foot of the room ladies fall in line behind partners, and continue in single file to head , where leader turns to the right, completes circuit around the room, passing to right of last lady (end of file), and continues in such manner that he has on his left a line (or lines) of promenaders, and on his right the center of the room, which he approaches by a spiral course. When near the center of room leader turns about (turning to the left) and reverses the process by marching between files of followers and in opposite direction until a single file extends around the room; continues thus to foot of room, up the middle to head , ladies to right, gentlemen to left, partners join at foot, march up middle by couples till in original position. With the Leads and Follows about six feet apart*, march from center of the bottom to six feet below center, then turn to face the sides (Leads turn 90° to left, Follows turn 90° to right). March to side walls, then turn to face the top (Leads turn 90° to right, Follows turn 90° to left). March four steps toward the top, then turn to face center (Leads turn 90° to right, Follows turn 90° to left). March from side wall to three feet shy of center, then turn to face the top (Leads turn 90° to left, Follows turn 90° to right), and march to the top. At the top, Leads turn to the left, and Follows to the right, and march along the side walls to meet partners at the bottom. *Clendenen 1895 doesn't specify how to get six feet apart, but one elegant way is to begin as in the March in File, and not quite meet up at the bottom. First couple lead the march up the center of the room, about six feet apart, to within six feet of the centre, separate, turn facing the sides of the room, ladies march to the right, gentlemen to the left. On reaching the side both turn one-quarter facing the top of the hall, march four steps forward, turn one-fourth facing partners and center of room, and march to center, turn one-quarter and march to center, turn one-quarter and march about six feet apart. On reaching the top of the hall ladies turn to the right and the gentlemen to the left and circle around to the back. March as couples to the top. Leads to the left, Follows to the right, marching along the sides of the room to the bottom. When Leads reach the bottom-left, and Follows reach the bottom-right, they turn to face diagonally across the room, to top-right and top-left, respectively. Leads and Follows march diagonally across the room, forming an X. The lines of Leads and Follows cross in the center of the room, with Follow crossing between her partner and the Lead behind him. When Leads reach top-right, they march along the right side of the room to bottom-right, and when Follows reach top-left, they march along the left side of the room to bottom-left. Repeat the cross and march along the sides of the room (on opposite diagonals and opposite sides of the room as before). When Leads have reached bottom-left, and Follows have reached bottom-right, they march along bottom to meet in the middle, and march as couples to the top. Note: Kopp writes that this figure can be shortened by recombining at the bottom after the first cross and traverse, but this seems odd, as it will end with the ladies on the left, leading. March by couples up middle of room; at head ladies to the right, gentlemen to the left, march to foot. When lady arrives at the right-hand corner and the gentleman the left-hand corner of the foot, they face around so that the lady faces the left-hand corner of head, and the gentleman faces the right-hand corner of head ; march in a straight line towards those corners, i.e ., diagonally across the room. At the center of room the line of ladies crosses the line of gentlemen, each lady passing through the space between her own partner and the gentleman following him; at head ladies face about to left, down left side of room to foot; gentlemen face about to right, down right side of room to foot; when the same can be repeated, or the leaders can continue until they meet at center of foot, and march up the middle by couples. This figure is very pretty when well executed. While the first five formations on this page are the most commonly described, and already provide more than enough options for a successful Grand March, J. H. Harvey suggests in Wehman's Complete Dancing Master and Call Book (1889) that other combinations can be introduced, "according to the fancy and invention of the leader." Other combinations can be introduced, according to the fancy and invention of the leader, but the five movements here given are very neat and effective, and will be found quite sufficient to entertain, without rendering the march tedious and wearing to those participating in it before the dancing commences. Most sources simply say that at the conclusion of the march, the leader signals for the first dance to be played, usually a waltz. The leader and his partner lead off dancing, followed by the other couples in turn, until "the dancing becomes general." Begin waltzing through the alleyway of the Arbor, as described above. Form quadrilles by ending "eight abreast" in the March in Platoons, as described above. Alternatively, end "four abreast" in the March in Platoons, and form quadrilles composed of the 1st and 2nd lines, the 3rd and 4th lines, etc. Form a double circle of couples for the Sicilian Circle [or Spanish Dance, or Circassian Circle, etc] in one of three ways: (1) march as couples into a circle, then the odd couples turn back to face the even couples, or (2) march "four abreast" into a circle, then the outside couples wheel around to the left to face the even couples, or (3) if there are enough couples to require two concentric circles of couples, march "four abreast" into a circle, then have the odd quartets turn to face the even quartets. End with The Jig, described in Reilley 1870 below. End with the Kaleidoscope, by A. C. Wirth, as described in Kopp's The American Prompter And Guide To Etiquette (1896). As soon as the leader of the dance escorts his lady to her seat, the Polonaise is ended, and the couples will disperse. Top couple balance and turn partners with both hands, half round. Then promenade down the middle, or execute a lively waltz, to the bottom of the line, where they remain till all shall have gone through, if preparatory to leaving the room, or waltz around the room to their seats, if opening the programme. Other figures may be introduced at pleasure and terminated in a similar manner; as the Serpentine March, the March from the Enchantress, and Fairy Spectacle of the Naiade Queen. Right and left, 8 Measures. Cross right hands half around, 4 "
Back with left, 4 "
Forward and back, 4 "
Pass to the next, 4 "
All promenade around the hall. At the conclusion of the march, the leader gives the usual signal, and the first dance commences. At the end of the march the leader stops, gives a signal for the music to play a Waltz, and leads off with his partner followed by the other couples. At the conclusion of the march, the leader stops, gives a signal for the music to be changed into a waltz, and leads off with his partner, followed by the other couples in succession until the dancing becomes general. If the Sicilian Circle follows, at the finish of the march, say "Please form for the Sicilian Circle; every other couple face about." Many prefer the "quadrille," or "sicilian circle," in place of the waltz, for the finish. Should you wish to form into either the quadrille or circle, march around the room and down through the center, four abreast, to the top of the room, all stop and at a signal for the music to change, first and fourth couples face, second and third step to the sides in the formation for a quadrille. If you prefer the circle continue marching around in a circle, four abreast until the couples are compact enough to form a circle, at a signal for the music to change, the first four should turn half around facing the second four, third four facing the fourth, etc. The odd couples turning around facing the even couples. 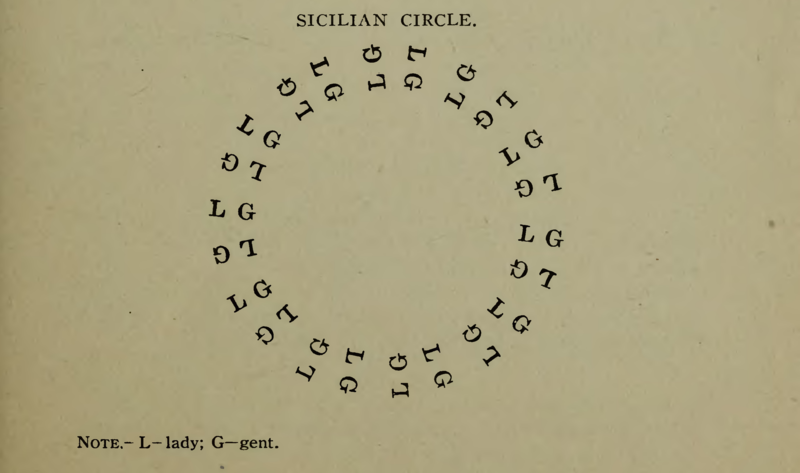 In case the Sicilian Circle is to follow the march, march around the room by couples, and stop when the circle is complete. The first, third, fifth, or all the odd-numbered couples turn about so as to face the second, fourth, sixth, or all the even-numbered couples. If there are many couples, so that one circle would overcrowd the room, march around the room four abreast until a circle is formed, then stop and form as above, four couples facing each other. The Kaleidoscope will be found very pretty and interesting for the opening of the dance. The author lays no claim to any new movements, only to the idea of harmonious combination; something that can be introduced and danced off hand, creating considerable pleasure, especially in assemblies of thirty or more couples.